12 Oct 2018 --- Probiotics hold major untapped potential in the sports nutrition arena, with greater scientific support for efficacy coming on stream in just the past 4 to 5 years. But there is still plenty of innovation potential to fill. This is according to Dutch Olympic Gold Medal speed skater and newfound nutrition entrepreneur, Mark Tuitert. Summit in Ede, The Netherlands. Since he retired from professional skating 4 years ago, Tuitert has increasingly adopted healthy bacteria into his regimen as the science has only recently emerged. This has led him to take fermented cod liver oil, which “has a terrible taste but does work” in the same way in which protein hydrolysates do boost performance despite their poor sensory qualities. But there has been a lot of work in industry around developing the science behind probiotics for sports nutrition. “I would love a good product like that. I just use a natural product, which works fine, but I think there is a lot that can be done in that area. I love the functional foods with extra added nutrition values in proteins,” he notes, for example. 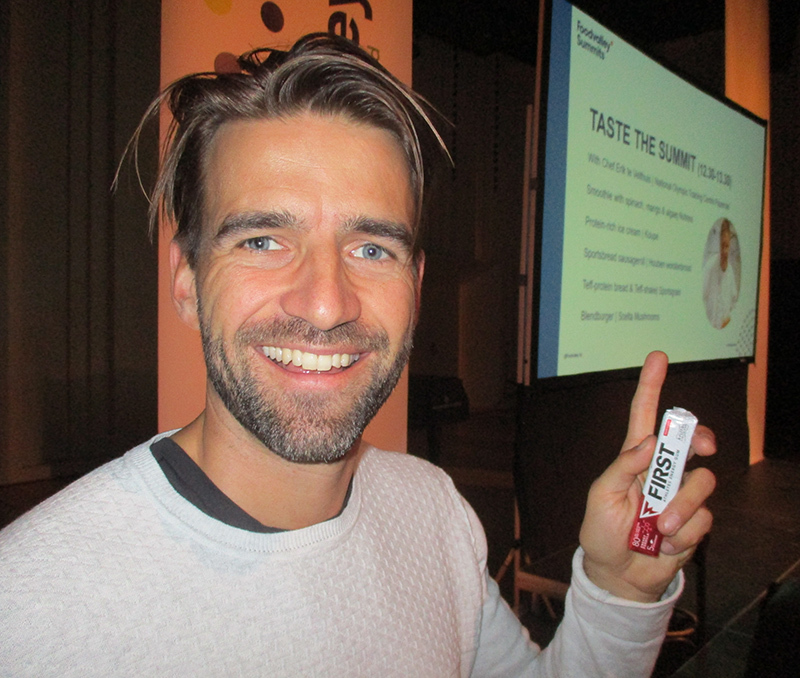 Tuitert will have been enthused by a speech at the Food Valley event from Jos Seegers, co-founder of MyMicroZoo, who highlighted growing research in the role for the microbiome in terms of sports performance. The MyMicroZoo analysis shows the composition of personalized microbiota and gives insight into how to improve vitality. A personal MyMicroZoo report provides an overview of the bacteria that are specific to that individual. 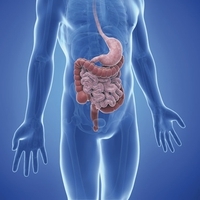 “Based on current knowledge, we provide insight into the balance between health-bearing and less good bacteria. You will receive tips on how to positively influence this composition through nutrition and lifestyle,” the company claims. Since he stopped professional speed skating competition, Tuitert has seen an evolution towards personalization in elite athlete training regimens. “There is a more individual approach now than in the past,” he says. “It was previously about working together with a coach and a nutrition specialist to aid the programs. Nowadays it’s more from the ground up in assessing how your body reacts to a certain ingredient and whether you have to take allergies or intolerances into account. Ultimately, every single body and every genotype is different. So it’s not only about differentiation in training programs but also in DNA. It is about what works best for you, also taking into account your own feeling, recording a diary and seeing if you can try some things that do and don’t work for you. Sports nutrition is no longer a one-stop shop,” he adds. Proteins are typically the cornerstone of elite athletes’ nutritional plans and despite the hype around alternative proteins in recent years, Tuitert does not believe we are there just yet in going completely vegan and maintaining optimal performance and recovery. Instead blends may be required. “If you put your body to the maximum stress level and cannot get any animal-based proteins into your diet, it is tough,” he admits. “It is a different amino acid composition, so you are missing something if it is only vegan or plant-based. It would make sense to do both or combine them. When you have proteins such as casein and whey, which differ,” he notes. 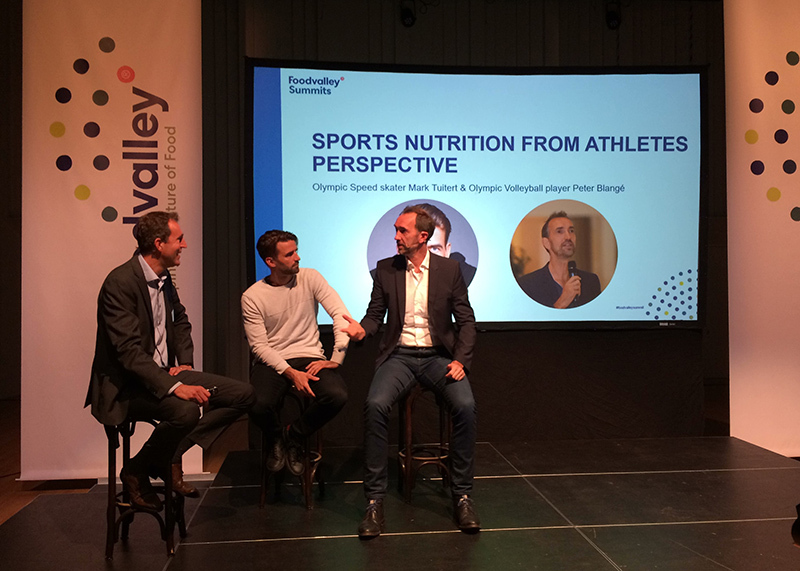 at the Food Valley Sports Nutrition Summit. It also depends on the goal as an athlete of course. “If you want to build muscle mass, you have to take casein proteins before you go to bed. But are you looking for fast recovery from your workout? Sports nutrition is in essence all about how much you can stress your body without breaking it,” he stresses. Tuitert may no longer be active in sports competition, but he has entered a whole new challenge on the business front following his retirement. In the run-up to the Vancouver Winter Games, he noticed a clear gap in available nutrition products around caffeine, which led to his entrepreneurial debut. “I knew as an athlete that caffeine works very well on many levels, but I wondered why there wasn’t a caffeinated energy product that works directly and doesn’t contain sugar? This was my question, as in my career I found that caffeinated pills were really slow to work. When they did kick in, however, they were too explosive,” he noted in a presentation at the Food Valley conference. “I didn’t want to consume energy drinks because of the sugar or the laxative effect of the aspartame. But I wanted the benefit of caffeine without the negative side effects of sugar,” he adds. Since launching two years ago, he claims that the brand is doing “really well.” “We produce ourselves and sell online. We are not going into shops yet, but every athlete in Holland knows about it by now. The goal is to go much broader than elite athletes. For the first year we are doing that, but we also get lawyers, pilots and drivers who are buying our gum. The goal is to expand to the mass market. It would be really cool to have a clean and working better alternative to an energy drink,” he adds. The mainstreaming of sports nutrition has, of course, opened up this larger target marketplace of “weekend warriors.” While Tuitert believes that the mainstreaming is positive, he stresses that there are no “golden bullets” to increasing performance and becoming fitter. “Generally the solution is just regularly eating well. After doing that you can enhance your performance or increase concentration through things like consuming energy gum. But I always say to athletes ‘this is not the golden bullet.’ It helps, but you also need to get your diet in order and your nutrition values, eat well and when you need it you take and then it works. It is not an alternative to eating well,” he notes. Tuitert was asked about whether the product would be promoted to kids amid the ongoing debate around energy drinks and children. “Children can eat our gum, but we don’t market it to them. It is really aimed at age 16 upwards, but there is no age restriction,” he says. “But I would rather that they use our energy gum than energy drinks because of the lack of sugar content,” he notes, stressing that sugar is a major threat to general health. “We have to go the way of sugar taxes because if you consume an energy drink or a sugary drink every day you have a 60 percent greater risk of getting diabetes later on,” he adds. Finally, how has he found the shift from being an elite athlete to moving into the food industry? It’s certainly quite a change, he admits, with achievement goals being less clearly defined. “My two companions are entrepreneurs already, so I learned a lot from them. But in the past, I had straight goals. Winning a gold medal is a clearly defined goal, but what winning is business actually means is much vaguer. It is about testing and seeing where you want to go,” Tuitert concludes.